Belle Sullivan's Blog | Welcome to my blog! Just a college kids opinion on some global challenges. List five take-aways from Guy Kawasaki’s talk and explain exactly how you will integrate that concept/construct/strategy into your project. Guy Kawasaki used the phrase “let 100 flowers blossom”. Going into Sierra Leone I worry that our team has only one idea in our heads for how our product will be sold. A big piece of what we are doing is adapting our processes to work in Sierra Leone. If there is one lesson that we need to be aware of, and embody, it is this idea of “let 100 flowers blossom”. Pivot. Another idea that Kawasaki brought up is the simple idea of marketing. He used interested anecdotes to make the ideas stick. I’ll be the first to admit that business is not my strong suit. It’s not an area that I have a lot of background in. However, after watching the talk I think I have a better idea of how our team’s venture can be successful. Despite being an optimist I often doubt not in the project, but in myself. The portion of the talk where Kawasaki said “don’t let the bozo’s get you down” made me think about my own attitude about our project. As long as I am dedicated to our work, there is no reason why I cannot make progress. I shouldn’t let the planning get in the way of the actual doing. My own self doubt, being the ‘bozo’, should not get me down. Another piece of advice that will be helpful for our team if not our project is the 10-20-30 rule. I noticed that we got too caught up in the things we planned to say to say what we meant to say. I think the less slides and the less words we will have on our slides the more freedom we will have to talk about a project that we know so much about. We have been doing the work, and documenting our process, it shouldn’t be difficult to present what we have done. We are the infected people that Kawasaki mentioned. We simply have to have a conversation about our passions. Lastly, and of utmost importance, MAT! Simple and easy to understand, I honestly think that the MAT ideology will make our venture a success. Milestones, assumptions, and tasks. Right now the milestone is getting a grow bag to begin, the assumption that we need to test is that our methods and process for spawn jars here will also work in Sierra Leone, and our task is to make sure that our assumption is correct, and more importantly to have backups in case it is not. This simple idea really helps focus a team and insure that the energy that we are putting into the project is being allocated to the parts of the venture that need it in the most. It’s all about productivity. In the seminar on the 18th we learned about design processes. We learned about how engineers tend to think of things more methodically and thus less creatively than “designers”. I don’t really think that this stereotype would apply to me. I like to think that I am very flexible when it comes to ideas and adapting thoughts that I have previously had. However, carefully documenting all our work in the mushroom making process is very important to me. The reason for this is because I would want to know what steps to tinker with. So while I think I would find it very easy to start fresh and adapt new ideas I would never do so without a reason, without there being a variable that I would want to test. I like to work with my hands and jump into projects quickly. The quicker the start the better. However, I really have a thing against being told what to do. Even with simple menial labor I need to know the end goal or the purpose of what I am doing. I feel this makes me a more effective worker. This carries through to how I will expect to work with others in Sierra Leone. I plan on validating my teams concept model through what I mentioned above. It is extremely important to me that we know exactly why what we are doing is working (or isn’t working). If we know the direct causes of success or failure and why they lead to that we should be able to justify anything we do. For example if we are telling people that they have to use sorghum grain to grow their mushrooms then I want there to be reason behind that. That it is the best grain for the purposes we need it to fulfill. I think this will help our team become the most effective it can be. If we question why we are doing things it will give us a better understanding of our project. I hope that this will foster trust between my team and the communities we work in. I don’t want the people we work with to feel like our students. They are our partners. I don’t want to give them a list of instructions and send them out on their own. I think it would be far more productive for both sides to our team to teach them what we do and more importantly why we do it. This way our partners can understand why we chose the model and now feel the need to alter it ( maybe for the worse) without us. It will also enable them to teach others if we are able to communicate effectively enough. Not to mention if people know why they are doing something it makes them better, and more effective at doing it. This is my personal philosophy at least. If we tell a farmer in Sierra Leone that sorghum grain is the best at spawning mushrooms in because we have found that it dries the quickest and this farmer knows of a grain that dries even quicker than sorghum then we are all the better for it. If we simply have them sorghum grain without any extra information the project would never be improved. I’d like to offer an alternate title to my blog. I think an equally appropriate name would be “Humanity < Termite Swarm intelligence”. This was a note I made after watching the Ted Talk on biomimiciry, while I might have been exaggerating a little bit depending on the context of the situation looking back it’s an interesting thing to consider. In the context of my mushroom venture this week my team and I have been contacting experts in the field and asking their advice on how to best grow mushrooms because we have had some difficulty in the past and are looking to improve our process. But who is the real expert in this mushroom growing area? It isn’t a human, its the mushrooms themselves and the area they they evolved to grow in. In this most basic sense we can use nature as a model or mentor to grow mushrooms after all nature is where they are made to grow. I think if we can mimic nature in our process it should not only help the success of the project but the simplification of the process. Another aspect of our project that nature can help us model is the temperature aspect. There are many ways that all kinds of different life forms use to keep themselves warm or cold. If the mushrooms we produce need to be grown at a lower temperatures we could study the adaptations of plants and animals in hot climates keep themselves cool. On the flip side mushrooms once grown are very sensitive and we should also try and look to nature as a model to store and transport the mushrooms in the most effective way. 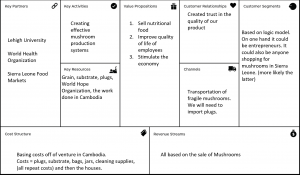 Designing Successful Social Enterprises” talks about optimizing your venture rather than maximizing it. They give examples like designing a stethoscope to be affordable and rugged rather than as precise as possible. 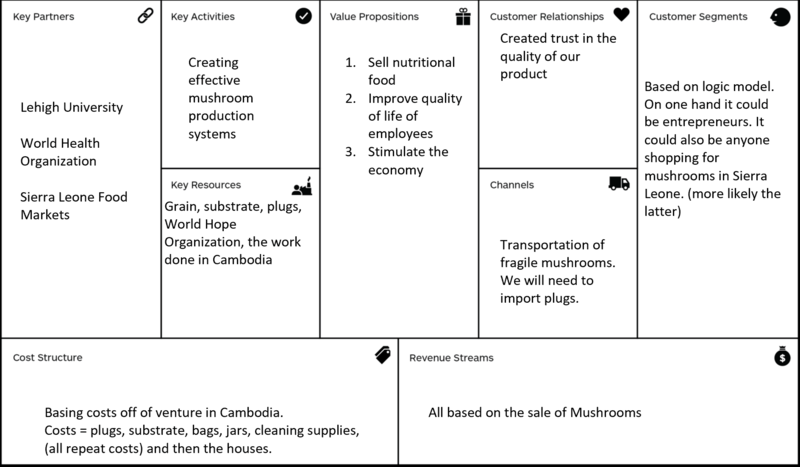 The section is about creating the most cohesive venture possible instead of simply creating the greatest output of product. In regards to my own project I interpreted this to mean don’t solely focus on outputting mushrooms think of the venture in a more holistic way. The entire process should be efficient and effective where every aspect can have a purpose and not be seen as waste. In accomplishing this and optimizing your venture the system as a whole will be better. This idea of optimize rather than maximize is similar in meaning to the phrase “cradle to cradle”. The idea is to stop the consumer-centric model we have of ventures (cradled to grave) and do something more sustainable. This wasn’t something I thought about when thinking about mushroom production in Sierra Leone. To be honest I am more worried about getting the supplies in the first place than what happens to them after they’ve been used. However, the idea of creating something truly sustainable, zero waste, is exciting and while maybe not achievable in one semester of work it is something every venture should strive for and something I will pay more attention to throughout the process of our venture. A friend approached me about the idea that gay culture is what has been keeping surrealism alive. It went dead after WWII and was kept alive in secret. This is alien to me because I barely know what surrealism is much less how it is impacted by war and the safety of the nuclear family. Someones job is Georgia (and maybe other states too) is to count butterflies because if you can prove that they are decreasing as a rapid enough rate then you can automatically make the land being surveyed a protected park. Honestly, this is such good news. I was excited to hear this because its important to keep lots of land protected in america, but I also had no idea that people wrote laws dictated by butterfly population. Another concept that I recently discovered (believe it or not) was delivery food. I suppose I have never lived anywhere urban enough to have food delivered right to your door but a few nights ago when my friends called for Chinese food and a half and hour later it showed up I discovered the magic. I think I knew in the back of my mind from movies and TV shows that this concept existed but I had never heard of anyone I knew ever doing it so it felt unreal until I experienced it first hand. My project revolves around growing mushrooms in Sierra Leone. In the past seminar we learned about possible cultural differences that have the potential to impact our ventures: like gender, race, identity, existing cultural norms, politics and technology. Though our mushroom growing group will not have as many cultural issues as perhaps the motherhood group simple because our project is less sensitive by nature, we still need to be aware of any cultural issues we may encounter in country. Even just a few moments of forethought can save your venture hours and hours of work in country. A cultural difference that Sierra Leone has with the United States is that their culture is not as familiar with mushrooms as our culture is. This will affect how difficult it is for our group to explain mushroom production and also the potential market for the mushrooms. While I don’t think this cultural difference needs to be directly addressed or solved by my group it is something we need to be aware of while we plan out how to best educated people about our ventures. While I don’t think race exactly will present an issue for my team, there is no denying that being white instantly makes you appear to be a foreigner in Sierra Leone. In my experience traveling abroad, being seen as foreign makes people more likely to take advantage of you because you are most likely not comfortable where you are. This could affect aspects of our project like buying materials and things of that nature, however, if my team is aware of this aspect of our project it shouldn’t be an issue. Along this line of thinking, the technology and concept of time in Sierra Leone is something I believe we will also have to be aware of when working. In the US things are very “go-go-go” and “don’t be late” all the time, and being used to that, my team and I will have to be aware that this isn’t the case in Sierra Leone. Time estimates will not mean the same thing they do here. On top of this we have to be conscious of the difference in materials. The group that went last summer just assumed that mason jars were a universal commodity. I’ve never experienced these issues at home because they stem from cultural issues but I did experience issues like this in my travels to the Dominican Republic. Especially the concept of time was a huge issues when we ordered materials to build a house and they didn’t show up until after we were on a plane back to the US. However, we learned to work around this and that getting local people who understand the culture and the way things work is a valuable thing to do. A cultural practice that can be leveraged to address a market problem we have is the style of market itself. Because of how sensitive mushrooms are, loading them into a truck and driving them for hours to be put on a shelf at a grocery store is an expensive and complicated process. Alternatively local open air markets that are common in Sierra Leone make transporting and selling mushrooms much easier and cheaper. The seminar also mentioned the difference between a grease payment and a bribe which is important if we need to put a rush on any aspects of our project and is definitely something we could use to our advantage. The African context for our project does present issues that we wouldn’t necessarily encounter in the United States. Some of these issues are mentioned in the above segments of my blog; for example, resources will be different, concept of time, and dealing with language barriers. Something else to be aware of was brought up during the presentation is that if you don’t really understand the culture you can encounter problems with “sticky information” or your project failing for reasons you couldn’t have foreseen. In the seminar on Mountain Top examples like treadle pumps, only having power windows in the front of a car, growing short corn, and coca-cola advertising in the middle east all showed projects failing for various reasons that weren’t predicted by the team. While the African context gives my team more to think about, it also provides different resources than the American context. I think that their lack of mushroom supply provides us with a great opportunity to fill an empty space in the market with few competitors. While the materials available in Sierra Leone are different than here in the United States, they are cheaper. Labor is also abundant. Why did I enroll in this course? Hello, welcome to my CINQ 396 blog. My name is Belle Sullivan and I’m a freshman studying Environmental Engineering. My real passion is for sustainability. This is how I first discovered the GSI Fellowship, through a Sustainable Leigh newsletter. What first drew me to the fellowship was the style of work. It wasn’t advertised as a class rather the fellowship gives students the opportunity to work through problems and try to accomplish something real. I won’t ignore the fact that the research and humanitarian aspects look great on a resume, however, I am pursuing this opportunity more to learn and create an impact in a global setting. Traveling to other countries gives you a perspective on your own life that you can never see from just living in america or an equally wealthy western nation. I think I learned more about what I wanted to do with my life on a month long trip to build houses in the Dominican Republic than I did throughout my entire high school career. Learning more about the world will increase my opportunity to impact it. For all these reasons I think the fellowship program is a great opportunity for students and I look forward to starting my work. How do I envision this course making me a better Environmental Engineering student? As mentioned previously, my main field of interest is sustainability. Our last seminar covered topics that I found particularly interesting. There are many more aspects to “impact” than simply creating technology that will enable a task to be accomplished. Previously I had imagined my work as an environmental engineer would be to create technology that could save the world, maybe perfect hydrogen powered cars or design a flawless city that consumed all the green house gases it emitted. However, as we talked about last night simply enabling these types of things to happen doesn’t mean that they will. There are other factors involved: is it marketable, will people want it, is it culturally acceptable. To create an impact you need to see the entire picture. There will always be road blocks and you have to be adaptable and persistent to create an impact. This seminar series has already taught me so much after just one session that I can’t imagine what kind of effect this course as a whole will have on my attitude towards not just my degree but my future in my field. Hopefully the seminar can give me a basis for thinking about problems that you can’t get just from classroom learning. In addition to this the fellowship will give me an opportunity to do research on a project that is relevant to my major. While I haven’t exactly started growing mushrooms yet after just one meeting with my team I feel I already have a good understanding of what our goals are and I’m eager to tackle the challenge and get some mushrooms to grow. I believe the key to this problem is affordability. The problem this eye-glass question poses as many angles. If there was a cheap and easy way for people with eye sight problems to be diagnosed this would be step one. “Reverse engineering” a machine of some sort that would allow someone less skilled than an optometrist to give people their prescription number would in turn let people purchase glasses without needing to see an optometrist. This isn’t the only step in solving the problem because many people cannot afford glasses or don’t have a place to buy them. However, once you create the demand for the product, glasses, it makes it easier for the product to be brought in. I would approach the problem by trying to create affordable tools that would encourage people, not optometrists, to solve the eye glasses problem.